Select and combine program options, including site visits and tours, to design the perfect in-Museum learning experience for your group! 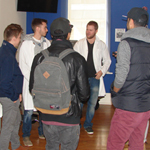 Return to the Education Programs page for more information and to book a program. Subscribe to our E-Newsletter for Educators. 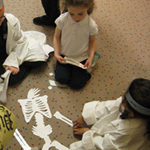 After handling real bones, students learn how bones give our bodies structure and help us to move through a special, active storytime inspired by the movements of animals. After learning all about fingerprints and skin, students create an animal-themed work of handprint art! Curriculum links: Inquiry Process and Critical Thinking; Learning Expectations in Language, Mathematics, Science, Health and Social Developments: Specific Expectations in Saying, Doing, and Representing. Why are healthy teeth important? 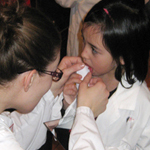 Participants take part in activities that focus on good oral hygiene, learn how to properly brush teeth, and identify plaque-fighting and plaque-causing foods in a "food frenzy" game. 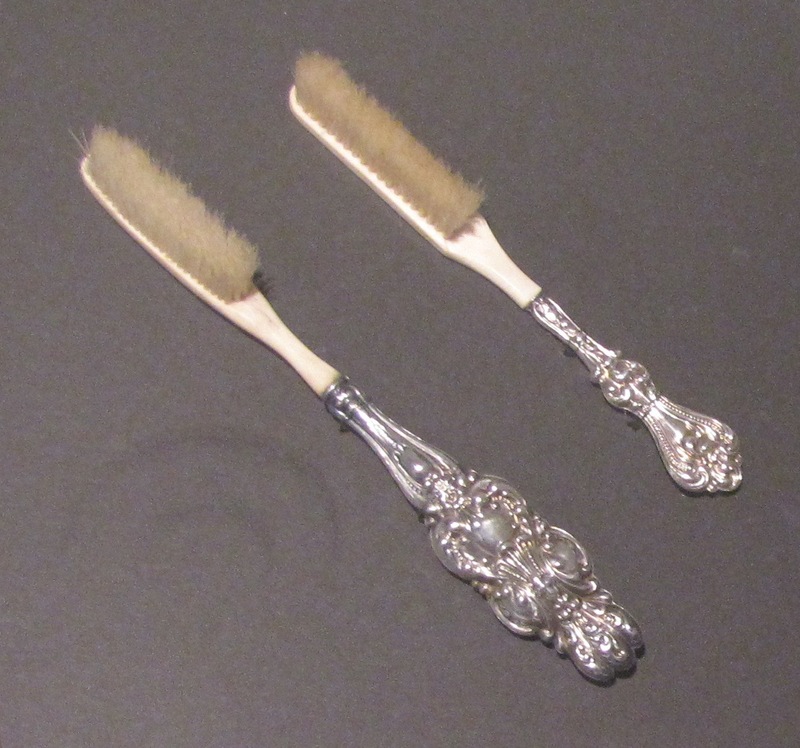 Toothbrushes will replace paintbrushes in an imaginative tooth-themed craft. Curriculum links: Science and Technology: Strand - Understanding Life Systems; Topics - Grade 1 Needs and Characteristics of Living Things, Developing Investigation and Communication Skills. Kindergarten Language Development and Literacy: Oral Language Development, Personal and Social Development. 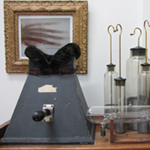 Students discover the tools that were invented and the major changes that occurred in health care between 1800 and 1900. After learning how reflector headbands were used by health care professionals, students create their own personalized reflector headbands. Curriculum links: Social Studies: Heritage & Identity: Grade 1 Topic - Our Changing Roles and Responsibilities. Science & Technology: Understanding Structures & Mechanisms: Grade 1 Topic - Materials, Objects Everyday Structures. How many bones do we have inside of us? How can we protect our bones and keep them healthy? What is a hinge joint and how does it help us to move? 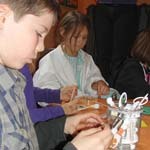 Students learn about the bones and joints in the human body and then work in groups to correctly assemble a skeleton. Curriculum links: Science & Technology: Understanding Life Systems: Grade 5 Topic - Human organ systems. 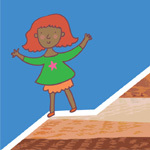 Health & Physical Education: Healthy Living: Grades 1-8 Topic - Understanding Health Concepts. Did you know that the skin is the largest organ in your body? Participants explore properties of this fascinating organ, and also learn about the integumentary systems of other animals. Hands-on activities and games include the creation of a personal Braille nameplate! Curriculum links: Science & Technology: Understanding Life Systems: Grade 2 Topic - Growth and Changes in Animals; Grade 5 Topic - Human Organ Systems. Health & Physical Education: Healthy Living: Grades 1-8 Topic - Making Connections for Healthy Living. 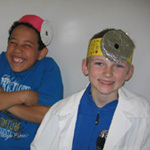 Participants will enjoy a hands-on adventure through the twisty, turny world of the digestive system! A series of activities all about healthy eating and digestion include the creation of food superheroes, and an active representation of the digestive system. Curriculum links: Science & Technology: Understanding Life Systems: Grade 5 Topic- Human Organ Systems. Health & Physical Education: Healthy Living: Grades 1-8 Topics- Healthy Eating, Understanding Health Concepts, Making Connections to Healthy Living. Teachers, ask about our diagnostic activity! A hilarious and wacky introduction to the human body's major organs! After learning about the important jobs our organs do, students play a game to correctly place organs on a funny body of their own creation. Curriculum links: Science & Technology: Understanding Life Systems: Grade 5 Topic - Human Organ Systems. Understanding Structures & Mechanisms: Grade 7 Topic - Form & Function. Health & Physical Education: Active living: Grades 1-8 Topic - Active Participation. 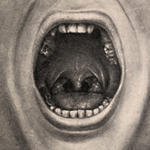 A wild, gross-out ride through medical history! After learning about the concept of the four humours, what happens to the air we breathe, and how we can control the spread of germs, participants mix up a batch of "snot" and receive a sample to take home! Curriculum links: Health & Physical Education: Healthy living: Grades 1-8 Topics - Understanding Health Concepts, Making Connections for Healthy Living. Science & Technology: Understanding Matter & Energy: Grade 5 Topic - Properties of and Changes in Matter. In 1900, patent medicines distributed by druggists were sometimes harmful. Students will brew medicinal potions (based upon real recipes! ), analyze advertisements used to sell patent medicines at the turn of the century, and create an advertisement for their own patent medicine. Curriculum links: Health & Physical Education: Healthy Living: Grades 1-8 Topic - Understanding Health Concepts. Science & Technology: Understanding Matter & Energy: Grade 5 Topic - Properties of and Changes in Matter. Online Exhibits and Activities available! "The Healing Power of Plants" traces our plant-based history and includes games, interviews, maps, quizzes, and other resources. Created by the Museum of Health Care. Hosted by the Virtual Museum of Canada. "Reading the Trade Cards" tells us about health, society, and advertising during the late 1800s and early 1900s. 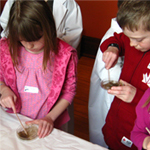 A hands-on introduction to traditional medicine significant to the Kingston area. 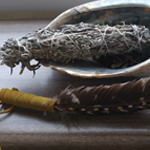 Create some "good medicine," make a personalized Medicine Wheel, explore the Four Sacred Medicines and Seven Grandfather Teachings, learn about the important roles of food and music in traditional medicine, and participate in a talking circle. Listen to the wisdom of a local knowledge-keeper. Curriculum links: Social Studies: The Impact of Interactions, Perspectives on Interactions and Significant Characteristics and Interactions: Grade 3 Topic - Heritage and Identity: Communities in Canada, 1780-1850; Grade 4 Topic - Heritage and Identity: Early Societies, 3000BCE-1500 CE; Grade 6 Topic: Communities in Canada, Past and Present. This project was funded in part by the Community Foundation for Kingston & Area, the Michelle Skolnick Smart & Caring Fund, the Gordon F. Tompkins Funeral Home Children's Endowment Fund, and the Smart & Caring Community Fund. 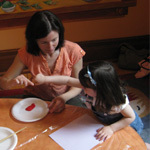 Hands-on activities and experiments offer a wacky introduction to the brain and nervous system. 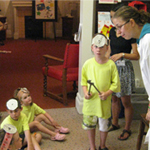 Students examine a real human skull from the education collection, test their reflexes, and create an imaginative map of their brains on their very own thinking caps. Curriculum links: Understanding Life Systems Grade 5: Strand - Human Organ Systems (Systems and Interactions, Structure and Function), Forces Acting on Structures and Mechanisms. 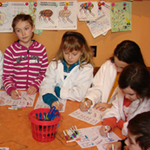 Hands-on activities stimulate discussion about early health care and surgery in Canada. 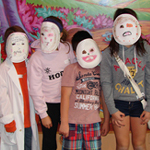 After a peek inside a doctor's bag from 200 years ago, students create "disease masks" signifying diseases common in Early Settlers in Upper Canada and mix up some Early Settler toothpaste! Curriculum links: Health & Physical Education: Healthy Living: Grades 1-8 Topics - Understanding Health Concepts, Making Connections for Healthy Living. Social Studies: Heritage & Identity: Grade 3 Topic - Communities in Canada, 1780-1850. Classroom kit available to rent. Western medical beliefs and practices were remarkably different 1000 years ago! Learn and play simultaneously with an imaginative game about medieval life and health care. What would your fate have been in medieval times? Students will also learn about medieval dentistry and make their own Tooth Puller necklace. Curriculum links: Social Studies: Heritage & Identity: Grade 4 Topic - Early Societies, 3000 BCE-1500 CE. Health & Physical Education: Healthy living: Grades 1-8 Topic - Making Healthy Choices. Take an eye-opening trip back in time to explore disease, medicine, and health care in Early Civilizations. After an exciting introduction, students create sculptures inspired by Ancient Greek temple offerings and customize a medical papyrus based upon Ancient Egyptian cures. Curriculum links: Social Studies: Heritage & Identity: Grade 4 Topic - Early Societies, 3000 BCE-1500 CE. Science & Technology: Understanding Matter & Energy: Grade 5 Topic - Properties of and Changes in Matter. Ever wondered why a balloon sticks to your hair after rubbing it? Spark your interest in the properties of current and static electricity by looking at their use in medicine from 200 years ago to today. After learning about wacky experiments with current electricity, participants will explore the properties of static electricity with hands-on activities. Curriculum links: Science & Technology: Strand - Understanding matter & energy; Topic - Electricity and Electrical Devices. This project was funded by the Community Foundation for Kingston & Area. What happens when our water isn't safe to drink? Through a combination of historical presentations, hands-on activity stations, and guided tours off site, students explore why controlling outbreaks and providing clean drinking water to people around the world is an important task. Curriculum links: Science and Technology: Interactions in the Environment: Water Systems. History: Grade 7 Topic - New France & British North America, 1713-1800; Canada, 1800-1850: Conflict & Challenges. Grade 8 Topic - Creating Canada, 1850-1890; Canada 1890-1914: A Changing Society. Geography: Grade 7 Topic - Physical Patterns in a Changing World; Natural Resources Around the World: Use and Sustainability. Grade 8 Topic - Global Settlement: Patterns & Sustainability; Global Inequalities: Economic Development & Quality of Life. This project was funded by the Community Foundation for Kingston & Area and the Rotary Club of Cataraqui-Kingston. Online Exhibit and Activities available! "Death in a Glass" is an investigation of when good water goes bad. Created by the Museum of Health Care. An exciting introduction to the developments in dental science over the past 200 years is followed by a lively discussion about DNA. The program concludes with an experiment wherein DNA is extracted from saliva! Curriculum links: Health & Physical Education: Healthy living: Grades 1-8 Topic - Making Connections for Healthy Living. Science & Technology: Understanding Matter & Energy: Grade 7 Topic - Pure Substances and Mixtures. Concepts in Social Studies and Thinking: Grades 1-8 Topic - Continuity & Change; Patterns and Trends. Historically, people who suffered from mental illness were defined as "mad." Today we have a better understanding of mental health, however, the stigma from our past remains. In this workshop students will examine the history of mental illness, its treatment, and ways to combat this stigma by creating their own positive mental health public service announcement. Curriculum links: Canadian and World Studies: Canada, 1914-1929: Grade 9 Topics - Citizenship and Heritage, Social, Economic, and Political Structures, Change and Continuity.. 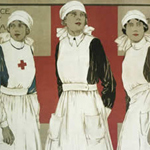 Participants will discover the importance of historical artefacts and explore what primary sources can tell us about health care and medical advancements during World War I. Health conditions during the First World War will come to life as participants see, touch, and use some of the same medical objects as the doctors, nurses and soldiers who served from 1914 to 1918. Explore the history of medical enhancements through the Museum's collection of dentures, prosthetics, and implants. This visit includes artefact handling, a presentation, and a gallery tour. Outreach option available. Online Exhibit available! "Joint Replacement" explores this routine--and revolutionary--medical procedure. How has a doctor's visit changed from the 1800s to today? 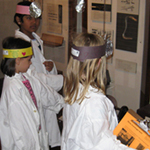 Explore the history of Canadian health care through hands-on learning, real museum artefacts, and lively discussions. Outreach option available. Online Exhibit Available! 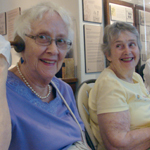 The former Museum of Civilization's "Making Medicare" explores the history, people, politics, and programs that have contributed to making medicare a distinctive thread in the web of social progress in Canada. With contributions from the Museum of Health Care. It's a bird! It's a plane! No, it'9s an otoscope! This hands-on artefact identification activity provides an exciting introduction to some of the items in the Museum's collection. Students examine mystery artefacts, searching for clues to figure out how they were used. Curriculum links: Social Studies: Heritage & Identity: Grade 1 Topic - Our Changing Roles & Responsibilities. Grade 3 Topic - Communities in Canada, 1780-1850. Language: Oral Communication, Reading. Online Activity available! "Name That Artefact" is a multiple-choice quiz that introduces some of the weird and wonderful objects in the Museum's collection. Our challenging scavenger hunts send students on a treasure hunt through the Museum's galleries as they work to complete a skill-testing activity sheet. Curriculum links: Language: Oral communication: Grade 1 Topic - Listening to Understand. Reading: Grade 2 Topic - Reading for Meaning. 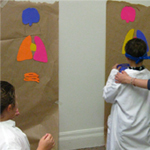 Science & Technology: Understanding Life Systems: Grade 5 Topic - Human Organ Systems. Understanding Matter & Energy: Grade 5 Topic - Properties of and Changes in Matter. Social Studies: Heritage & Identity: Grades 1-8 Topics - Early Societies, 3000 BCE-1500 CE, Early Settlements in Upper Canada, Relationships, Rules & Responsibility. * Can be preceded by 15 min. gallery introduction or 45 min. gallery tour. Step into the rich past of Canada's health care and learn more about the artefacts on display in our eight onsite galleries. 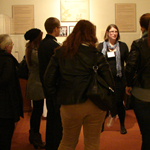 This engaging tour illuminates fascinating details about the history of health care in Canada. Peg legs, microscopes, and more! Enjoy a special behind-the-scenes look at our basement collection storage facilities, home to one of the largest collections of medical artefacts in Canada. 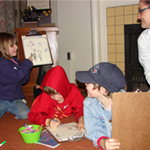 Should your group wish to visit the Museum independently, we can provide age-appropriate, curriculum-linked scavenger hunts to facilitate this exploration. It is rare to find a family not affected by Type 2 Diabetes; approximately 1 in 10 Canadians have been diagnosed. Many are also living with pre-diabetes. The first step in control is education. 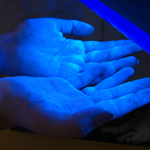 Learn what you can do to either prevent, or live with, this current epidemic of diabetes. Curriculum links: Science & Technology: Strand - Understanding life systems; Topic -Cells. Health & Physical Education: Strand - Healthy living; Topics - Understanding health concepts, making healthy choices, making connections for healthy living. 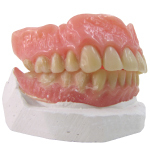 Explore the history of medical enhancements through the Museum's collection of dentures, prosthetics, and implants. This visit includes artefact handling, a presentation, and a gallery tour. Outreach option available to seniors' residences, May-August. How has a doctor's visit changed from the 1800s to today? 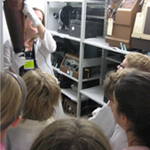 Explore the history of Canadian health care through hands-on learning, real museum artefacts, and lively discussions. Outreach option available to seniors' residences, May-August.